We praise and glorify the name of God Almighty, Creator of the Universe, the giver and taker of life, the protector and the magnificent for His mercies and blessings to us on earth. And we thank Him most profoundly for the gift of our lives as we enter the New Year in His blazing glory. I send you warm, fraternal greetings on your hospital bed. I am short of words, but my heart pulsated in painful strains when I heard the sad news of your unfortunate accident on a motorbike in Abuja. A pensive mood instantly engulfed me and till this very moment, my eyes are wet with tears. I am a mere mortal, with no power to question God on why He permitted this misfortune to befall you; nevertheless, I still asked rhetorically that why you and not me? If the mystery of life had made it possible to share your direct pains, myself and millions of Nigerians would have borne on your behalf, the pains of the injuries you sustained in the bike crash. I am far away in London for studies, or else, I would have been at your bedside, day and night to assist nurses speedily nurture you back to good health. Those on ground have assured us of their very best and we trust the Almighty God for your healing. My dear Compatriot , you remain an idol because of your almost flawless personality. Like your father and great leader of our dear country, President Muhammadu Buhari, you are an epitome of discipline, humility and hard work coated in humanism. Your respect for the core values of humanity and existence are legendary and uniquely stands you out among your peers and siblings of privileged families anywhere in the world. We look unto your exemplary character and conduct for emulation. We are proud of you as a source of inspiration to countless young Nigerians. I have no hesitation to say you are a great citizen of our beloved country, Nigeria. I want to assure you that the motorbike accident is just a phase in your life, and like the Holy Scriptures say, “this too, will definitely pass away.” And you will recuperate and bounce back on the streets to reunite with your family and friends in robust health very soon. Do not falter in strength, as I personally perceive it as nectar to fulfilling your positively pregnable destiny in the nearest future. There is no doubt that our country needs your education for regeneration and strength of character for leadership in the nearest future. 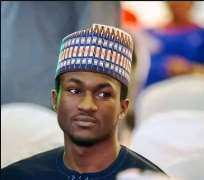 I, like millions of other Nigerians are silently beseeching God Almighty in prayerful supplication for your quickest recovery, as each day you spend on the hospital bed, is a great loss to humanity whom your upright character is silently remoulding in homes and palaces throughout Nigeria. Please, permit me to end by counseling that as soon as you are discharged from the hospital, rededicate and redouble your efforts in the selfless service to humanity, from whose prayers, flows the abundance of God’s blessing on your life, family and Nigerians. While I hope to visit you soon, may Almighty God spotlessly heal your wounds and elongate your life, and all humanity with your temporary incapacitation, Amen! Wishing you a happy and prosperous New Year. A Patriotic Nigerian Activist based in the UK.